What does it mean to be in “ketosis” and why does everyone want to be there? The diet of the moment seems to be Ketogenic. This new and trendy diet has actually been around for 100 years. When I was studying nutrition in the late ’90's, ketosis was something we were taught to avoid. The accumulation of ketone bodies can change the chemical balance of your blood, it can cause dehydration, worsen kidney malfunction and in some cases can put you in the hospital (with ketoacidosis). Today, we are touting it as the best way to lose weight. So what’s the deal with ketones? Ketones are a type of acid made in your liver and everyone has them. Ketosis is a normal metabolic process, something your body does to keep working. When it doesn't have enough carbohydrates from food for your cells to burn for energy, it burns fat instead. As part of this process, it makes ketones. Before this was introduced as a method for weight loss, doctors were using it to treat patients with epilepsy to prevent seizures and other neuropathological disorders. Under medically supervised conditions, a ketogenic diet proved to have great results for reducing seizures with an unexpected side effect of weight loss in about 20% of those studied. Fast forward to the latest craze to hit the diet industry … The Keto Diet. Now that you know the science behind ketosis and a little about it’s history, what’s next? Should you clear your pantry of everything carbohydrate and run to your nearest McDonald’s drive-thru? Because, let’s face it, the high fat (sometimes processed) components of the keto diet are similar to a McDonald's menu. The first thing you need to assess is your medical history. Most importantly, are you a Type-I diabetic? If so, this diet is non-starter. In diabetics, ketosis can be fatal. Ketone bodies can build up in the blood making it acidic and can lead to extreme consequences if you have uncontrolled, type-I diabetes. If you have a history of heart disease, kidney or gallbladder disfunction or high cholesterol, I personally, would not recommend this plan but always check with a doctor before making a drastic change in your diet. In healthy individuals, accessing fat as your main source of fuel can aid in weight loss. This is the main reason why people are adopting this plan. Initially, the weight loss comes from water. Carbohydrates hold onto water in your liver and when you reduce them drastically from your diet, you experience water weight loss. Theoretically, as you replace carbs with fats and protein, further weight loss ensues in the form of fat. The typical plan is broken down into 75/20/5 (percentage of Fat, Protein, Carbs). For most of the American population, this is a drastic shift in our “regular” intake. American diets are made up of upwards of 60-65% carbohydrates. Keep that in mind when thinking about taking up keto and how it may affect your body initially. Some have reported experiencing what doctors call, “keto flu”; this takes the form of headaches, muscle aches and fatigue. If you feel these symptoms, it is important to stay hydrated and include electrolytes until the side effects subside. According to WebMd, ketosis usually kicks in after 3 or 4 days of eating less than 50 grams of carbohydrates per day. That’s the equivalent of 1 cup of fruit or 2 slices of French toast. However, the process of ketosis is highly individual. Some people may need a more restricted diet to start producing ketones and others can start to feel the effects right away. It’s no secret that avoiding bagels and muffins will help you lose weight but what about healthy carbohydrates? They are pretty much non-existent on a keto diet. Many people following this plan avoid fruits and vegetables which are rich in antioxidants and protect against high cholesterol and other diseases. Although research shows faster weight loss on ketogenic diets when compared to low-fat, moderate carbohydrate plans, there is controversy over long term results. Part of that controversy may be that people can’t maintain this way of eating long enough to be studied! So is “keto”a sustainable practice? As a vegetarian, it’s almost impossible. These diets are typically heavy in red meat, fatty foods and high in salt. Remember, they are not just “low-carb”; keto diets are mostly high fat and moderate protein. So, just because you lower your carbohydrate intake, does not mean your body will go into ketosis. In fact, if you add too much protein, a process called gluconeogenesis will occur where your body will begin to burn stored glucose for energy instead of fat, kicking you right out of ketosis. So what does all of this mean if you are considering “going keto?” Chances are, your number one reason for trying this diet are for the weight loss benefits. And chances are (if you strictly adhere to it), you will get those benefits. It is questionable, however, if weight loss will be long term. It is also unclear if any negative health effects result from following this diet long term. The way I see it, fad diets are just that. They are not a realistic, sustainable lifestyle, nor are they very balanced. Are you going to forego a piece of cake on your birthday every year? Maybe. But how much fun is that? The original Ketogenic Therapy is known as the classic Ketogenic Diet. All Ketogenic Diets are a variation of classic Keto, which is the most strict, seen by it’s ratio of fat to protein and carbs, also called the macronutrient ratio. Classic Keto carries a 4:1 ratio, which means that there are four parts fat for every one part protein and carb. Since fat has a higher caloric content versus protein and carb (fat has 9 calories per gram, while both protein and carb have just 4 calories per gram), 90% of calories come from fat in a classic Ketogenic Diet, while 6% come from protein, and 4% come from carb. The main difference between the five types of Ketogenic Diets is this macronutrient ratio. All Ketogenic Diets are high in fat, adequate in protein and low in carbohydrates. This combination changes the way energy is used in the body, converting fat into fatty acids and ketones in the liver. When there is an elevated level of ketones in the blood, one is in a state of ketosis, which has a variety of therapeutic benefits for the sick and healthy including weight loss. In addition to the macronutrient ratio, the frequency of eating can influence ketosis. More specifically, a practice called intermittent fasting, which reduces the window of time a person eats throughout the day, can help in obtaining and sustaining ketosis. When the eating window is shortened, the body is forced to access energy from its own fat stores rather than calories directly from the diet. For example, a 16:8 intermittent fasting plan means you will fast for 16 hours (ideally, half of which is during sleep) and then you will eat during the remaining 8. In other words, if your last meal is at 6pm then your first meal the following day would be at 10am. Some people combine a Ketogenic diet along with intermittent fasting in order to increase their rate of weight loss. 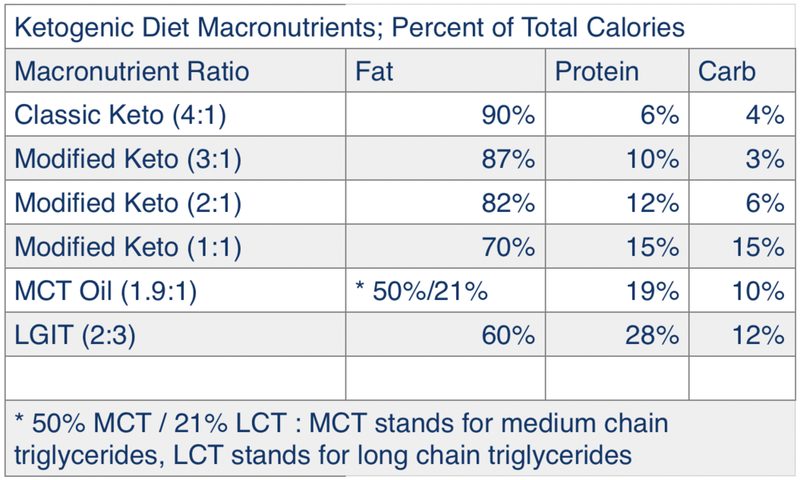 The chart below outlines the macronutrient ratios and their caloric percentage counterpart for different variations of the Ketogenic diet.